Nicknamed �A. J.�, Johnson is one of the winningest players in pro beach history. He has won over $1,654,000 (fifth best among domestic players) with 44 event titles (tenth-best). Johnson, who also ranks tenth among domestic players in tournaments played (247), did not compete in 2001 due to injuries. Johnson and Karch Kiraly just missed qualifying for the 2000 Sydney Olympic Games when Kiraly suffered a right shoulder separation in the final FIVB qualifying event. Johnson was an alternate for the 2000 Olympic Games for the United States. Johnson and Kiraly placed fifth at the 1999 FIVB Beach Volleyball World Championships. Johnson won 16 of his pro beach titles with Kiraly as the tandem posted 39 �final four� finishes together in 62 starts. 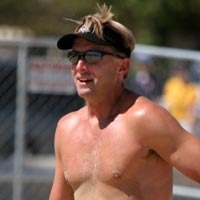 He won the King of the Beach in 1994 to break Karch Kiraly�s streak of three-straight titles. He has professional experience both indoors and on the beach. Johnson, who has been a member of the U. S. National Team, was a three-time All-American at USC where he led the Trojans to three straight NCAA tournament berths. He graduated from USC with a Communication degree in 1987. Johnson and his wife (Jennifer) have a son and a daughter.